I've been to the top of that! For years when driving between Tucson and Phoenix I always thought about climbing to the top of Picacho Peak and would say I want to go to the top of that sometimes when we went by. Back in 2010, I finally did it with Dad. 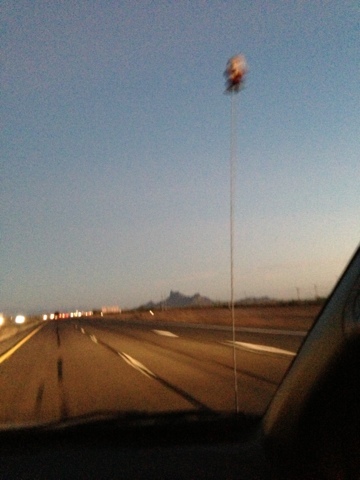 Then began a tradition of me saying I've been to the top of that everytime I first spotted Picacho Peak when on the I-10. Now it has evolved into almost a competition of who says it first with Mom saying when we were on the way to the Case Grande Ruins the other weekend, have you been to the top of that when we first saw it? Now on the way back from being in San Diego Dad was sure to say I've been to the top of that first. Mom had been listening to something with headphones and ten minutes later said you've been to the top of that because she didn't realize we had already done that whole thing. Guess we're going to find some new thing to point out on road trips from Huntsville, since we won't be going by Picacho Peak often after we move in early 2013.